That said, the Super Bowl was another good excuse for us to invite family and friends over. Once the game was done and the kitchen was tidied, though, I got back to reading Circe by Madeline Miller. Miller's first book, Song of Achilles, was the first book I finished this year, and it was riveting. Miller's gifted writing and her intimate knowledge of the flawed characters of Greek mythology make her stories utterly fascinating. Her characters are emotionally-driven and promiscuous, but they also help us understand what it is to be human, and where our choices could lead. The Lake House by Kate Morton: This has nothing to do with the Keanu Reeves movie that my husband humorously reminded me about when he saw this book on my shelf. Instead, it's the swift moving story of an English family's split after their toddler disappears, and the truth that begins to unravel many years later as their oldest daughter connects with a young detective to understand what happened. I'm interested in the The Lake House because of its themes of responsibility, motherhood, friendship, mystery, and guilt. MaddAddam by Margaret Atwood: My husband finished this final book in Atwood's dystopian trilogy years ago, so it's high time I catch up to him so we can discuss it together. Atwood's novels are somber, but they simmer with creative, dark humor. A recent meal I ate at a vegan burger café reminded me of Chicky Knobs, and a friend's description of the hymns at a progressive atheist church reminded me of the fictional hymns sung by the radical environmentalist group in this MaddAddam trilogy. Dystopian novels show us how society can go terribly awry, and I love how they inspire me to take action against the wrong turns I see in our society. If you like dystopian novels like I do, you should also read Station Eleven by Emily St. John Mandel. The Brothers K by David James Duncan. Duncan is a beloved writer here in Oregon, where he's written The River Why and other stories set in the beauty of the Pacific Northwest. My husband enjoyed The Brothers K. (Again, I'm trying to catch up on some of his favorite reads!) The story follows a family's course through the 50s and 60s as the sons grow into adulthood, face religious choices, and deal with the brutality of the Vietnam War. Something in the description reminds me of A River Runs Through It—poignant, tragic, and yet moving and meaningful. Kristin Lavransdattir trilogy by Sigrid Undset (The Wreath / The Wife / The Cross) : Sagas aren't a genre that I'm typically drawn towards, but Undset won a Nobel Prize for Literature, and her Norwegian trilogy comes highly recommended by Sarah Clarkson in her autobiographical celebration of reading titled Book Girl. In summary, Kristin Lavransdattir is a headstrong heroine in Norway's dark 15th century; this tale of historic fiction recounts her early life, marriage, motherhood, and estrangement as the Black Plague spreads. I'm intrigued by all the lavish reviews! Two From Galilee by Marjorie Holmes: I'm going to read this just before Christmas because it is a fictionalized account of Mary and Joseph's story that seems to be fairly impactful. Readers say it is well-researched and emotionally moving without being preachy or overly fictionalized. Hannah Coulter by Wendell Berry: Hannah Coulter was published more than ten years ago, but I'm hearing about it everywhere now. In this sequel to Jayber Crow, an aging and twice-widowed Hannah retells her life and reflects on her connection to the land her family has farmed. I should probably read both novels for their time-worn perspective and significant contribution to American literature, but Hannah Coulter can stand on its own too. Off the Clock: Feel Less Busy While Getting More Done by Laura Vanderkam: The author is a speaker, writer, and mother of four, and yet she focuses on sharing concrete principles here for lingering in life's best moments. While I don't want to bow to the idol of "getting more done,” I'd like to learn from her experience and perspective as she explains how to ensure one's life has space for the moments with the most significance. Digital Minimalism by Cal Newport: Newport's latest book also argues that it is possible to choose a focused life in a noisy world. He's an associate professor of computer science at Georgetown and an author whose books (like Deep Work) are always well-received, so I'm sure I could pick up some sage advice on living wisely and carefully in a digitally-saturated culture. Begotten or Made: Human Procreation and Medical Technique by Oliver O’Donovan: This is a series of fascinating and clearly argued lectures given on the topic of Christian ethics and reproductive medical technology. O’Donovan specifically focuses on the ethics of IVF procedures and the choices our societies will soon be facing, as well as those techniques that are already in practice. This was recommended by a friend for its fascinating and thoughtful arguments. How to Teach Your Children Shakespeare by Ken Ludwig: Ludwig is a celebrated playwright who shares the practical ways that he taught his own young children Shakespeare, helping them to delight in the wit and wisdom of Shakespeare's passages. I'm reading this now and it's a quick and highly applicable read, reminding me why Shakespeare matters even to the very young, and how to make memorization enjoyable. Ludwig writes the book for teachers as well as parents, and shares free printables on his book's website. The Brave Learner by Julie Bogart: Bogart regularly shares insightful homeschooling tips and parenting wisdom on the Brave Writer Podcast, and this book promises to funnel that wisdom into a highly practical format. Bogart focuses on answering the question of how parents can educate their children through modeling what it means to be a truly Brave Learner. You Learn by Living: Eleven Keys for a More Fulfilling Life by Eleanor Roosevelt: Published in 1960, Mrs. Roosevelt's collection of essays is still considered useful, wise, and informed by readers today. I'll listen with respect to what this distinguished first lady had to say. Educated: A Memoir by Tara Westover: There's a lot of buzz around this autobiographical story of a girl who was raised by a "religious nut” of a father and an extremely lax homeschooling mother who never allowed Tara to go to school—yet she managed to attain a PhD from Cambridge. A friend recommended this book to me and I cannot wait to read the author's perspective on her unusual educational path. I haven't regularly read novels in French since my college years, partially because French novels can be harder to obtain, but also because reading in a non-native language seemed to require too much effort for an otherwise pleasurable pastime. However, I'm going to start choosing more French novels because I want to grow my language knowledge, keep pulse with French literary culture, and broaden my perspectives. For those of you who don't read in French, however, the novels below are also available in English. Chanson Douce by Leila Slimani: This initially seems like the story of a seemingly perfect nanny who murders her charges, but the author weaves the story back into a beautiful text about family, race, and purposeful relationships. I began reading this in English (The Perfect Nanny) and realized it would be a better read in French since I kept mentally trying to translate it back to French. Esclave vieil homme et le molosse by Patrick Chamoiseau: This the acclaimed story of a slave's escape into a Martinique rain forest filled with the spirits of former slaves. I'm excited to digest a novel so rich in Caribbean culture as it forces me to reflect more on the value of race and human dignity. The English translation of this is Slave Old Man. The Circle of Seasons by K.C. Ireton: It seems to me that the Protestant church is showing an interest back towards the rhythms of the early church calendar. This book was written by a homeschooling mama last year and it has excellent online reviews. I am intrigued to learn more from Ireton about the Christian way of marking time. Great Doctrines of the Bible by D. Martyn Lloyd-Jones: This book was recommended by our church's new pastor as a solid read to gain a deeper understanding the Bible's theology. I love the Bible itself, but I'm always open to the insight that can be gained from an educated, astute commentary. The Divine Conspiracy by Dallas Willard - I was gifted this book by a family member who appreciated its life-changing arguments for living an authentic Christian life. Willard is a theologian and philosopher at the University of Southern California; I will appreciate his thoughtful emphasis on discipleship. The Hidden Art of Homemaking by Edith Shaeffer: I love the Shaeffer's story about L’Abri, their ministry of hospitality and theology spreading worldwide from their simple Swiss chalet from the 1950s through the 1980s. Here in The Hidden Art of Homemaking, Edith describes how homemaking is essentially creative as well as meaningful. I want to learn from her experience hosting hundreds of visitors while still raising a family and maintaining a mostly peaceful, beautiful home environment. 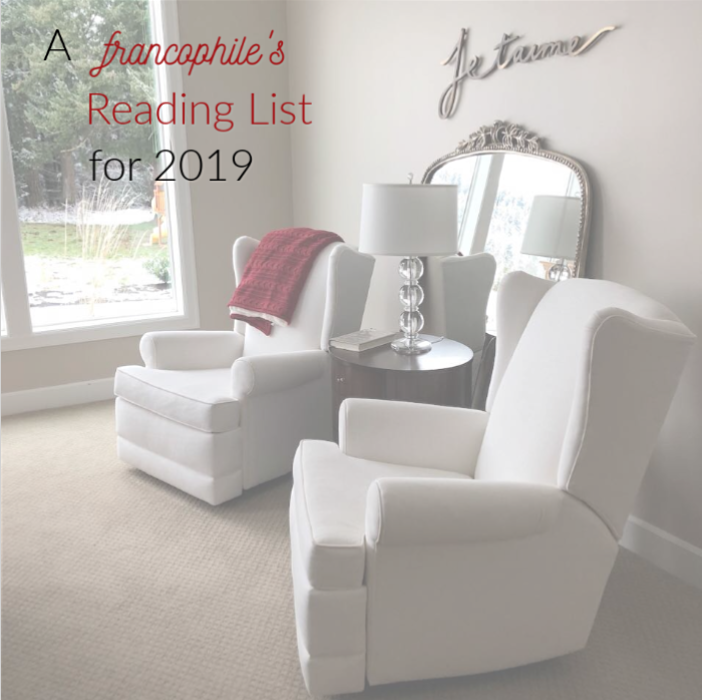 What are you planning to read in 2019? If you've read any of the books on my list, what did you think of them? Happiness is better when shared, so I look forward to hearing your what's on your reading wish list. This post contains affiliate links. Merci for supporting Intentional Mama!